The immensely popular Star Wars Lightsaber Chopsticks! Star Wars-themed chopsticks shaped like the lightsabers of Obi Wan Kenobi. May the Force be with you at every meal! Comes with translucent chopstick rests. You've been asking for it, and now "Chop Sabers" are back by popular demand! 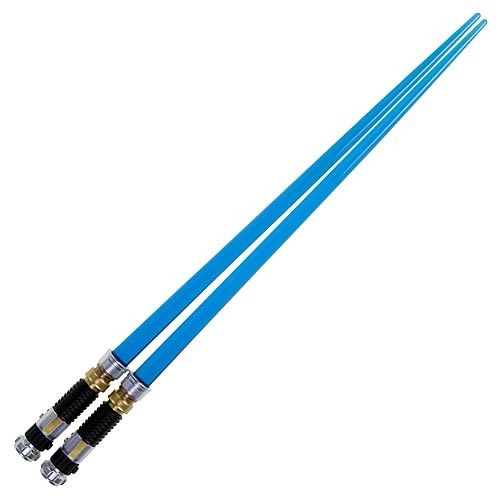 Suitable for eating sushi or defending the galaxy, the chopsticks' blue lightsaber blades are cast in translucent material. Each 9-inch long miniature replica is intricately sculpted and detailed, matching their appearance in Episode III: Revenge of the Sith! Fully safety tested and colorful and exciting, lightsaber chopsticks are fun for the whole family. Don't miss out on these out of this world collectibles! Product does not light up. Ages 14 and up.